128 Marion, Iowa. 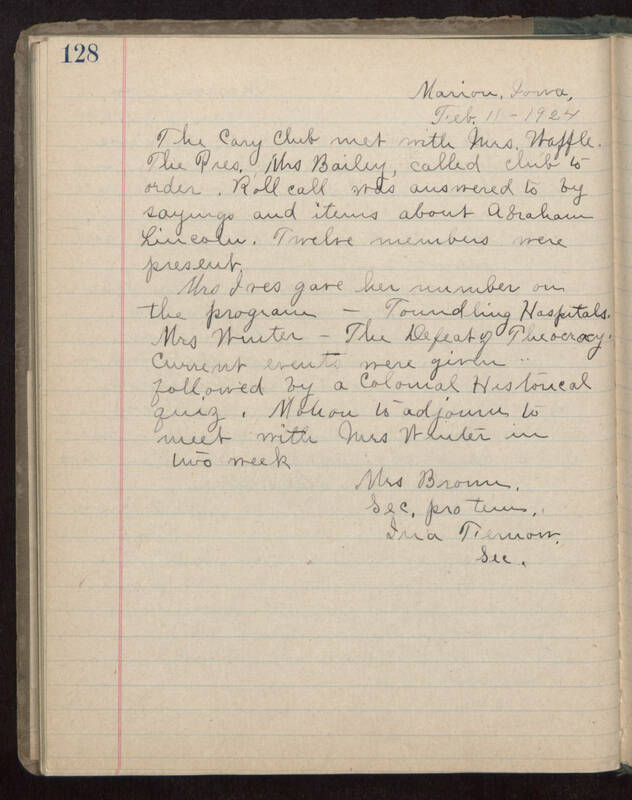 Feb. 11 - 1924 The Cary Club met with Mrs. Waffle. The Pres. Mrs Bailey, called club to order. Roll call was answered to by sayings and items about Abraham Lincoln. Twelve members were present. Mrs Ives gave her number our the program - Foundling Hospitals. Mrs Winter - The Defeat of Theocracy. Current events were given Followed by a Colonial Historical quiz. Motion to adjourn to meet with Mrs Winter in two week Mrs Brown, Sec. pro team, Lina Fernow, Sec.